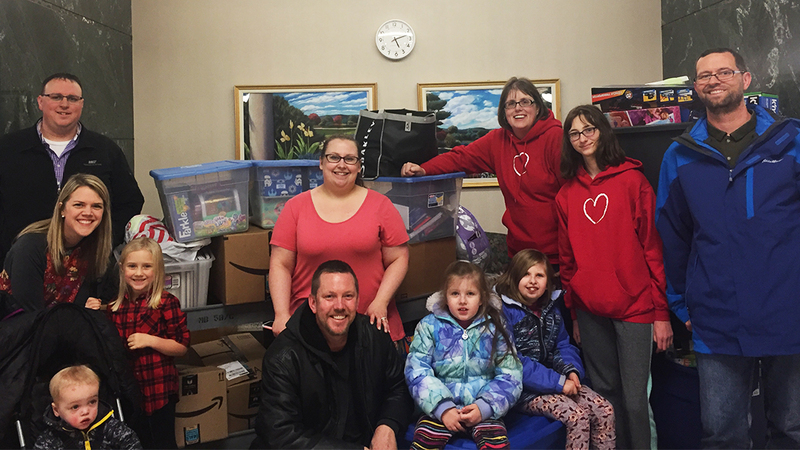 Mayo Clinic “heart families” who support the toy drive include the Waletzkos (left) and Rippys (center), as well as Kari and Rob Ulrich (right) and their daughter, Sydney, who participate in memory of their son and brother, Cameron, who passed away following a heart transplant. Linsey Rippy tends to go overboard when it comes to toys around the holiday season, which is a good thing for children in the hospital at Mayo Clinic, where donations from Rippy's annual toy drive end up. Young Teagan Waletzko was spending a lot of time in the hospital. Far more than she cared for. But it was the only way Teagan, then 3, could see her new baby brother, Isaac, who was born with hypoplastic left heart syndrome, a rare congenital heart defect. "Finding ways to keep our family together and keep some normalcy was challenging when we needed to spend lots of waking hours at the hospital," mom Michelle Waletzko tells us. "We brought her with us as much as we could, but she got bored easily." During one of Teagan's visits, a nurse took her for a walk. When she came back, Teagan had a new toy — and one for Isaac as well, courtesy of a toy closet on Mayo Clinic's Rochester campus. "It made Teagan feel special and welcomed and it kept her busy in the hospital room so we could enjoy being a family," Michelle, a sonographer at Mayo Clinic, tells us. "It was an amazing gift at a time we needed it." Linsey Rippy knows all about that kind of need. Her daughters, 12-year-old Madi and 9-year-old Sydney, each had a heart transplant at Mayo Clinic. And Linsey has seen — many times — the difference a new toy can make to a child confined to a hospital bed or worried about a procedure. 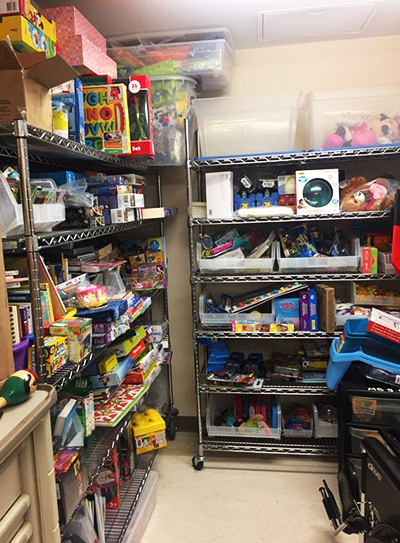 So each holiday season, Linsey organizes a toy drive to make sure there are plenty of treats and treasures in the toy closets throughout Mayo Clinic. "We want to help create good memories of the hospital," Linsey says. She also delivers gifts to the Ronald McDonald House, where her family has often stayed. Each fall, Linsey creates an Amazon wish list for the toy drive, now in its eighth year. She fills it with things her girls have enjoyed, as well as ideas from other "heart families" and hospital staff. There are items for kids of all ages, from infants to teens, and some for parents as well, such as gift cards to area restaurants and coffee shops. "When you're sitting at your child's bedside, you may not even think about eating until after the hospital cafeteria's closed," she says. In addition to toys, books and movies, the list also includes lots of fun socks in all sizes. "Sometimes socks are the only thing of their own kids can wear in the hospital," Linsey tells us. "It's something you don't really think about until your kid is hospitalized." Linsey tells us that the toy drive also is a way she hopes to teach her girls about the importance — and the joy — of giving. It's a joy that she's passed on to others as well. Two years ago, the Waletzko family helped Linsey store and transport items for the toy drive. The experience was so "uplifting" that the next year "we went full swing into collecting donations," Michelle tells us. "We love being part of this community and being able to give back. Life in the hospital is hard, and it's even harder over the holiday season. It has been such a blessing to be able to interact with other families and realize such a small gesture can make such a big difference." If you're in the mood to make a difference ('tis the season! ), consider purchasing an item off the wish list Linsey created for the toy drive. If you're in the Twin Cities, you can also drop donations off at Adagio's Pizza in New Brighton, another supporter of the toy drive. Then gift us with your comments below before using the social media tools atop this page to share this story with others.